From his Christmas vacation with his family in the Silicon Valley, Pham Duc Trung Kien, a visually impaired investor known as “the bridge builder between the US and Vietnam,” shared his thoughts regarding Vietnamese education. In the spring of 2003, Kien was tasked by the White House to set up Vietnam Education Foundation (VEF) that would grant scholarships to the brightest Vietnamese students to attend graduate programmes in the US. To do so, he was traveling back and forth between the two countries to ensure the programme would run smoothly and efficiently. Kien is currently the president and co-founder of Vietnam Foundation, a US non-profit organisation that provides educational support to Vietnamese people. A renowned business investor in Vietnam, he is also a senior advisor to private equity firm TPG ($75 billion globally) and has invested in national champions like Vinamilk, FPT, Masan, VMG, among others. Additionally, he is the vice chairman and founding shareholder of Topica, the top online education company in Vietnam, and is also an advisor to GotIt!, the rising Silicon Valley startup. Kien holds a bachelor’s degree in international marketing from the University of Colorado Boulder, an MBA, and an MA degree from the renowned Stanford University, where he was honoured as one of the 100 most outstanding alumni in the first 100 years of the school. 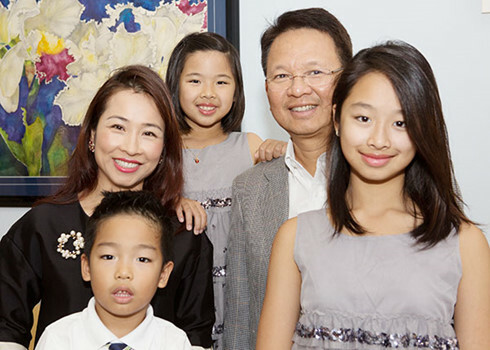 Currently residing in Ho Chi Minh City with his wife and three children, he went back to the US on the last days of 2016 to spend the Christmas holiday with his family. You have become known for “connecting Vietnamese and US education.” When did it all start? You could say that education was my joy at the springtime of my life. My belief in education came from the foundation that my parents, my family, my teachers, and the Vietnamese society have given me during the first 18 years of my life, before I even had the chance to come to the US in the autumn of 1977. In the US, I was lucky to meet kind-hearted people who encouraged and guided me during the course of my studies. Understanding how important education is for personal development, I realised I have an obligation to help Vietnamese youths have the opportunity to get educated both domestically and at top US schools. From this realisation came ideas and then actions. I have since endeavoured to bridge the gap between the educational systems in Vietnam and the US. I am aware that you have worked through many jobs, from physical work to assisting top officials at the White House. Does any of that experience affect VEF in any way? Maybe due to my optimism, I always find interesting and rewarding aspects in my work. However, the most rewarding thing is to see my beliefs come through and be affirmed by positive results. When I set out to run VEF, people were very sceptical as they thought Vietnamese students did not have what it takes to win admission to top US universities like the MIT, Harvard, Stanford or Berkeley. The pessimism all came from people with years of experience in education, and they all said our programme was doomed to fail before it even started. But I, personally, saw it in a different light. I believed that despite the fact that Vietnam was still under-developed and full of difficulties, the country had many young talents that could compete at top US schools—with considerable success, no less. To me, the most important thing is the selection process, which must be fair, transparent, and open. It must not be tampered with in any way or by anyone. Having overcome a few initial obstacles, I completed an operational procedure for VEF. Within two years, there were more than 100 Vietnamese students who got accepted to Master’s or Doctorate programmes at top US universities. This was an incredible achievement, not only for our programme, but also for the students, their families, and those who contributed to their education in Vietnam. 20 years is not a short time, but we have begun to see the fruits of our tireless efforts. Even though we only see the blooming flowers now, I believe the spring is coming for education in Vietnam. And from the flowers of today, we will see the fruits of tomorrow. Why will the VEF program end in 2018? The act passed by the US Congress that regulates the operation of VEF and guarantees an annual grant of $5 million, will expire in 2018, and along with it the programme. With VEF, the US has opened the door for Vietnamese talents to access world-class education at top US schools. The next step will rest entirely on Vietnam. Vietnamese students can now apply directly to Master’s or doctorate programs in the US, and the institutions are already familiar with Vietnamese applicants. The Vietnam Foundation will have a new programme in place to assist these new young talents. Besides, I believe the Vietnamese government or any group of Vietnamese business people can establish a programme similar to VEF. I have discussed with the US National Academies to provide support should domestic funding be made available. It is a smart investment to put a lump sum of $5 million a year to help the most talented Vietnamese to attend the best graduate programmes in science and technology in the US. Looking back, are you satisfied with what you have done for Vietnamese education? I have yet to finish what I set out to do, so it is hard to say that I am satisfied. However, I am happy and proud of the achievements of young talents that I have had the pleasure to support. They are the people who will make a difference and will bring Vietnam to the global stage. When he was still alive, General Vo Nguyen Giap gave me a calligraphy frame with the saying: “For the benefit of ten years, plant trees. For the benefit of 100 years, educate people.” Maybe I need 100 springs before I could say that I am satisfied. What nickname would you like people to call you? I am just a bridge builder. Each bridge has its own name, but the builder normally remains anonymous. And I smile with satisfaction with such default anonymity. As a graduate from America as well as the founder of VEF, what do you think about the current hurdles in front of the Vietnamese education sector? For me, good education must have three things: good teachers, good students, and good curriculum. We do not need an impressive campus with expensive teaching materials as long as we cannot focus on these three things. Fortunately, through open educational platforms, such as VOER, OCW, and OpenStax, we can easily access world-class curriculum freely through the internet. Hence, we can focus on getting good teachers and students. However, it is difficult to be a good teacher if you have to run from one school to another to earn enough to survive. It is difficult to be a good student if you have to pay bribes for a decent grade, instead of preparing for your exam. We need to take a long, hard look at the reality of the situation and must relentlessly strike to stop corruption, which erodes the moral fibre of Vietnamese education. For me, education is the only and the shortest way to personal prosperity and independence. It is also part of the national roadmap to future development and success.